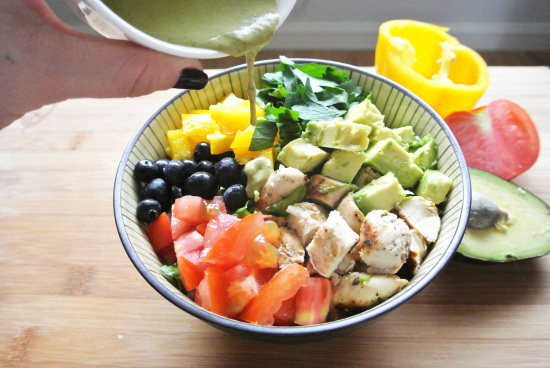 It's Food Friday yet again and we're here sharing an amazing recipe from the Shanghai Spice blog called "Rainbow Salad + Creamy Basil Dressing." 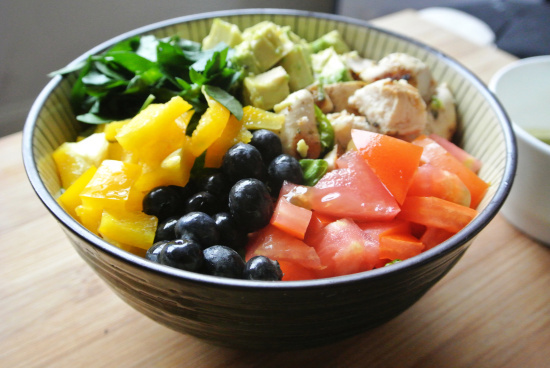 This salad is the perfect balance of savory and sweet with tomato, yellow pepper, avocado, chicken, and (of course) blueberries on a bed of romaine lettuce! Fresh basil, lemon juice and greek yogurt make the dressing a creamy, flavorful staple that ties the whole dish together. The blog's author, Erin, said "By the way, blueberries in salads is my new favorite thing ever. Actually, blueberries in everything. Actually, just blueberries." We couldn't agree more Erin! Find the entire recipe on Erin's blog, Shanghai Spice.